Whether you’re starting from scratch or just renovating, choosing what floor finish to implement is one of the many unavoidable dilemmas faced by all in the interior design process. Before you and your spouse can even begin the war over what colour the drapes in the study should be or how many pillows should go on the bed (1 for every head, any more than that is blasphemy), one must first decide on what floor these battles will be fought on. A floor finish is one of the many imperative steps in the home décor process and one that will set the style and tone of your home’s interior design. It’s important you familiarize yourself with a few of the floor finish options at your disposal. 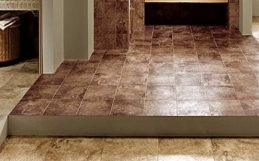 Starting off with ceramic tiles, one of the most standard of floor finishes around. A multi-purpose and reasonably durable finish, ceramic tiles can be used on floors, walls, countertops and patios amongst others. They are also easy to clean, and reasonably simple to maintain. In terms of design, ceramic tiles come in a wide variety of shades and styles. Similar to ceramic tiles, are marble tiles in terms of versatility and maintenance however marble tiles are made from, you guessed it, marble, which is a type of rock. Now unless you’ve been living under a carpet your whole life, you’d know that, aesthetically, rocks are limited to well, rock colours. Marble tiles though, remain for an elegant and classy finish option for any home. Another choice is wooden flooring which is a great aesthetic option. More commonly used outdoors, it can also make for a great indoor finish. Interior designs that pair well with wooden floors may not be as common, but those that do, do so very well. Carpeting is a less permanent option than most other finishes and the design styles are nearly endless. Carpets, however, do not respond well to liquid and through trial and error, this writer has determined that you cannot in fact mop a spilled glass of chocolate milk off of a carpet. Other options include Linoleum, the wallpaper equivalent of the flooring market. Linoleum is made exclusively from natural raw materials for you tree-huggers out there. Natural stones, concrete and even glass round up some of the lesser used floorings. Right, now we can get straight to it. What should you consider when choosing a floor finish? The answer is simple. You. Now, before you go and plunge yourself into an existential crisis, I ask that you at least read until the end of this paragraph, after which, by all means, go contemplate the futility of life. When selecting a floor finish, just ask yourself a few questions. Firstly, what is your ideal life? Now imagine the ideal home attached to this dream. From here, you can select the interior décor and from there, the floor finish that best compliments it. This is because it is important to understand the influence a floor finish has on the home above it and how long the floor will be there. While you can always change a coat of paint or replace the vase on the dining table, flooring has an air of semi-permanence to it that requires a bit more introspection, not only with regard to who you are, but who you are going to be. Before you can even dream about the peak, you have to lay down the foundations. Yeah, bet you weren’t expecting a philosophy lesson in the middle off an article about linoleum and stamped concrete but we’d like to consider ourselves one of the more, well-rounded home decor blogs. So maybe you see yourself with 2 and 1/2 kids sitting around the fireplace in your rustic styled condo, with a wooden floor finish. Or maybe standing in the foyer of your hilltop mansion with polished marble floors. Or even just lounging in the living area of your bachelorette apartment, heels kicked off atop a white satin rug. Either way, it’s important to consider that a finish is not just a floor but the base on which your dreams are built. Or maybe not, either way, it’ll cost a hell of a lot to replace them so best choose wisely.